Although established as recently as 1963, Lake Havasu City has grown steadily and now ranks as the fourth largest city in Arizona, excluding those in the greater Phoenix area, and is especially popular as a retirement destination owing to the year-round hot and sunny climate. The city is built beside beautiful Lake Havasu on the Colorado River, and reached by Hwy 95 between Parker and Topock, on I-40. The extensive residential district lies on the east side of the highway; a network of quiet, winding streets built on gently sloping desert land with views of the lake and the rugged Mohave Mountains to the east. Shops and restaurants are concentrated around the intersection of McCulloch Blvd with Hwy 95, while most hotels are located along a side street west of the highway, just a short walk from the lakeshore. 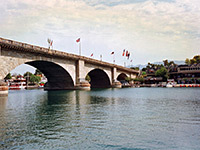 The most famous site within the city is London Bridge, spanning a channel between the shore and Havasu Island, home to a golf course, campground, resort and many sandy beaches. 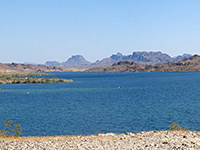 More of the shoreline is contained within Lake Havasu State Park a short distance south and Windsor State Park to the north. Along the main hotel street in Lake Havasu City (London Bridge Road), the Hampton Inn is a well established, 4 floor, 162 room property with a nice setting close to the edge of the lake - west-facing rooms look out over a quarter mile of undeveloped land towards Windsor State Park on the shoreline, while the hotel is within a mile of the famous bridge, and many shops and restaurants along McCulloch Boulevard. Amenities include free hot breakfast, a fitness center and a pool, on the secluded west side of the property. All accommodations contain a refrigerator and microwave, and some have a private balcony. New for summer 2018, the Holiday Inn Express has a prominent location in Lake Havasu City adjoining London Bridge - on the west side of Hwy 95, a short walk from the shops and restaurants overlooking the lake channel, and a short drive away from many other scenic locations along the shoreline. The hotel offers 96 rooms & suites on four floors, plus the usual brand amenities of free hot breakfast buffet, an outdoor pool, a business center and a fitness center. The main visitor center for the city is right next door. Fully refurbished following its conversion from a Ramada Inn, the Quality Inn & Suites of Lake Havasu City has a central location in town, between Highway 95 and Lake Havasu Avenue - half a mile from the lake, London Bridge, English Village and the Bridgewater Links Golf Course. This is quite a large hotel of 177 rooms, in several interconnected blocks with a restaurant/bar and outdoor pool/hot tub at one end. Free hot breakfast is provided, and all guests receive a coupon for discounts on other meals. Some rooms contain a microwave & refrigerator, while also available are suites with whirlpool bath and extra pull-out sofa bed. The northernmost chain motel in Lake Havasu City is the 41 room, pet friendly Travelodge, situated in a lightly developed residential area along London Bridge Road, within a short walk of several restaurants along nearby Hwy 95. Guests may also walk to the lakeshore, just 1200 feet west, here rather bushy, but sandy beaches can be found a little way south, in Windsor State Park. The well regarded inn offers clean, comfortable, affordable lodging in a two floor, interior corridor building, with the usual entry level amenities of free continental breakfast, free wi-fi, a hot tub and a business center. A microwave and refrigerator are installed in each guest room. Guests at Days Inn Lake Havasu are within easy walking distance of the main shopping center in town, along McCulloch Boulevard near the junction with Hwy 95, including over a dozen restaurants. London Bridge is 0.4 miles west. Rooms are on two exterior corridor floors, looking out across the parking lot, which has a small outdoor pool on the secluded south side, away from the main road; there is also a hot tub and bbq area. Continental breakfast and wi-fi are complimentary. A microwave and refrigerator are available in some of the rooms. The Rodeway Inn is one of the closest hotels to the edge of Lake Havasu - located along London Bridge Rd, the building is just 0.3 miles from the shore, close enough for the west-facing rooms to overlook the water; some have a private balcony for extra viewing pleasure, and all contain a microwave/refrigerator. Formerly a Howard Johnson, the hotel was fully redecorated and upgraded in 2009, and provides guests with a good range of facilities including free internet access, free continental breakfast, an indoor pool/hot tub, laundry, and basic business services. There are several restaurants a few minutes walk away along the main road. Many of the rooms at Motel 6 Lake Havasu City Lakeside have views over the lake, just 0.2 miles west across a patch of undeveloped land. The building is small but fairly new looking, with interior corridors though no special amenities. The road past the motel (London Bridge Road) has a few restaurants; many more, together with various large stores, can be found a few blocks east along Mesquite Avenue and McCulloch Boulevard, on the far side of Highway 95.